View our 2016-17 Info Sheet here. Mission: The Chicago High School for the Arts (ChiArts®) develops the next generation of diverse, artistically promising scholar-artists through intensive pre-professional training in the arts, combined with a comprehensive college preparatory curriculum. 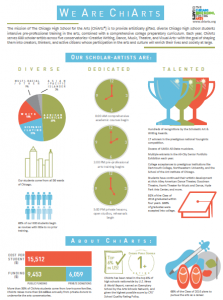 ChiArts’ diverse scholar-artists will thrive as creators, thinkers, and community members, and their participation in the arts and culture will deeply enrich their lives and society at large. In 2004, The Elizabeth Morse Charitable Trust and the Elizabeth Morse Genius Charitable Trust convened a group of approximately ten arts and education organizations to discuss the issue of diversity within mid- to large-sized arts organizations in Chicago and specifically the lack of representation in this landscape by professional artists representing the many ethnic communities who call Chicago home. The Diversity Working Group (DWG) surveyed the Chicago landscape to identify existing educational resources for aspiring young artists across a broad age spectrum, keeping in mind the concentrated, focused training required to prepare young artists for professional careers. 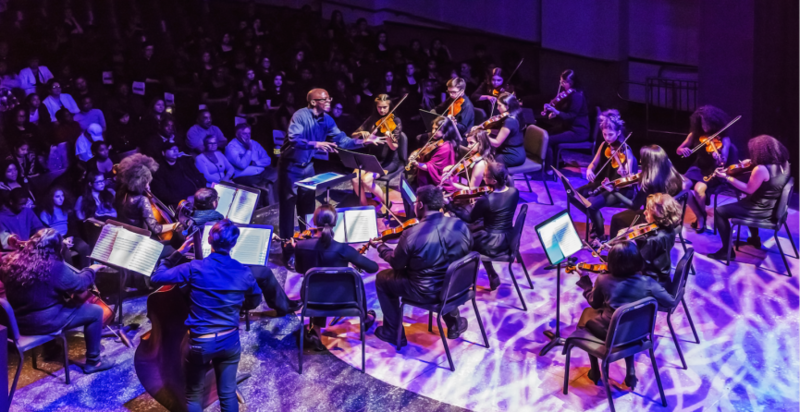 Incredible richness within the existing resources in Chicago’s many excellent privately funded community music schools, youth orchestras, university music programs and major cultural institutions were evident. What was not found was a public institution that would provide a comprehensive learning environment with superior training at the high school level – a critical stage in development for the aspiring young artist. This age group stood out as the one area of greatest need and also that with greatest potential for positive impact. Once it was decided to pursue the idea of an arts high school, the group undertook conversations with key senior administrative members from Chicago Public Schools to assess receptivity and possible options for the creation of an exceptional arts-focused educational institution in Chicago. DWG members conducted site visits and/or spoke to officials at several public and private arts high schools in other cities. At that time, Renaissance 2010 became an avenue for establishing new schools and offering students and parents a quality choice in education. Civic leaders were identified by the DWG members to become the executive committee that would lead the project through the application process. The Chicago Board of Education approved the school on October 24, 2007. The executive committee became the founding board of directors of the school and ChiArts opened its doors for the first time on September 8, 2009. Creativity—We pursue artistic and intellectual inquiry through active use of imagination, and we take risks towards passionate innovation. Community—We support personal growth, respect diversity, and foster citizens who positively affect the intellectual and artistic life of Chicago and give back to the community through service. Integrity—We hold ourselves and each other to high academic and artistic standards through honesty, sincerity, and accountability. Humility—We allow our artistic and intellectual talents to speak for themselves, acknowledge our history, and are open to constructive criticism, realizing our finest achievements could not happen without the contributions of others. Balance—We strive to lead well-rounded lives; we are reflective, and we manage our energies in ways that are productive, healthy, and foster connection with others. Perseverance—We demonstrate courage through self-discipline and dedication as we embrace a willingness to move through obstacles with resilience.